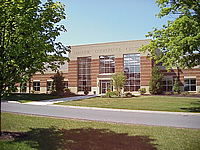 The Masonic Conference Center – Patton Campus is located on just over 20 acres of beautiful hillside property in the heart of Lancaster County, PA. The facilities include an indoor gym, outdoor tennis courts, a half-Olympic sized indoor pool, a state-of-the-art multimedia center, and a variety of styles and sizes of meeting rooms. We can host up to 162 overnight youth and chaperones, in rooms housing from 2 to 6 people. All campus buildings are air-conditioned, and guest rooms have independent thermostat controls and private baths. This isn’t your average summer “camp,” kids! Click on the links below to get a look at this beautiful facility. You can also get directions to the campus, and information on how your Masonic youth group might participate in an activity here.